My first iPhone application is live and kicking! In the first few weeks since it went live in the app store, it has been installed by almost 5,000 people. The feedback is flattering and very encouraging (thanks, you know who you are...). I have been using several other readers which I have not been very pleased with. I have only used your reader for a few minutes and will never look at another reader again. Your reader is the best by far. Thanks for your hard work. Install it for free from the iTunes App Store. Checkout this video for a quick demo and see below for a short summary. I love listening to audiobooks and podcasts on my iPhone but the built in player on the iPhone is really not designed with audiobooks in mind. My biggest gripe with the built-in player was that if I was in the middle of an audiobook and I wanted to listen to a podcast or some music, I lost my bookmark. Then I had to figure out where exactly I was and navigate back which, with some audiobooks, can be a hassle. The other source of frustration was that it was very hard to skip back a few seconds when my mind wondered off and I missed something important. There's a 30 second rewind button but it is too small and insufficient. Well, I decided to do something about it and developed an audiobook player for the iPhone. My player automatically keeps track of where I am in each title I listen to. It has a recents list so I can quickly go back and forth between audiobooks and podcasts I recently listened to. When I choose a title it lands me right back where I left. Navigation within a title is greatly improved with convenient skip buttons for 10 second, 1 and 10 minute jumps (as well as by track). The app has a sleep mode (like your TV) so if you fall asleep, it won't continue playing for hours on end. It has a few more nice features but in the interest of brevity I won't list them all (got to leave some surprises for the video clip... ;-) ). The fully featured app is free to install for evaluation. After a couple days, assuming you like it and want to continue using it, it will remind you to purchase the app using In-App-Purchase. Nothing more to download. Just purchase for $2.99 to unlock and continue enjoying your audiobooks. 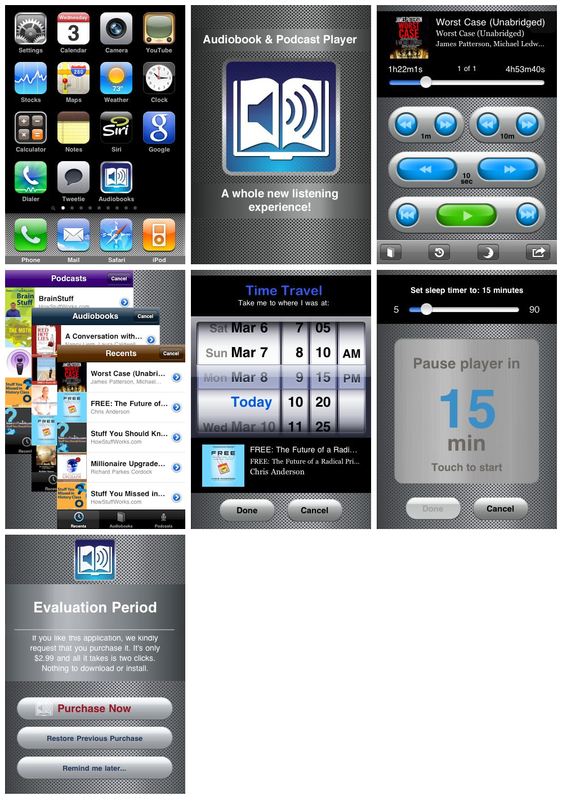 I think all apps should be made available for evaluation this way, don't you? Now I can really enjoy my audiobooks and podcasts! I hope you'll enjoy my app as much as I do. Try it out and send me your feedback. Do you perhaps have one for blackberry laying about? Doesn't seem to support chapters. I have yet to find an audiobook player for the iphone that does! What gives? Looks pretty nice, and will go on my shortlist of players. My wish list would be, possibly instead of the time machine feature, to have the ability to set a few permanent bookmarks for each book, and allow the user to go to one, then return to where they were. This would be useful for setting a place where, for example, certain characters are introduced, and you need to refer back to refresh your memory. I haven't tried it yet, so I hope I'm not making a needless suggestion. PS I have an iPod touch - hope it works for that, too. If you're still awake when the sleep timer kicks in, it would be nice to be able to easily start it playing again. I LOVE remapping the volume controls to skip, could make it so that hitting either button after sleep mode has kicked it will restart it (and restart the sleep timer)? I prefer short sleep timers and restarting frequently until I fall asleep then it's not hard to find the last thing you remember before you doze off. Hi again, I posted the previous Anonymous comment. I just bought my first A2DP bluetooth headset and I'm thrilled to learn that you can play/puase and skip tracks with the controls on the headset! I would LOVE to use this to good affect with your app, in particular to control the sleep timer. As I said before, I like to reset and continue listening frequently, and a button on the headset would be a dream. The only change that would need to be made is to have the sleep timer reset to the last set time if you hit play after it times out. (Or better yet, have it reset whenever you pause and then hit play, that way you can extend it whenever you want and get back to full volume when it starts to fade out). If you can intercept the track forward/back from the headset and remap it to 30s skips it would be a close to perfect as I could imagine! This is a great app - the best Audiobook reader I can find for the iPhone/iPad. However, it seriously needs updating to iOS4 so that it can support multitasking, allowing the audio to be played while reading the book on iBooks for instance. Is this on the horizon? For a great app that just needs a few tweaks, it'd be a shame if it isn't developed further. I Love the look and feel of this app, it does everything it says and looks great while doing it, however I will not be buying it until as the previous reviewer commented it incorporates multitasking. Currently every time you switch in and out of the app the audiobook stops and to listen has to reload, and because of this the standard apple player currently offers more. Its a shame because if it did have this feature paying for this app would be a no brainer!!! Just started using the App. Great so far. I like being able to jump forward! A couple of things that I would love to see would be the ability to speed up the playback. Depending upon the reader, I like to listen to it faster or slower. Also, it would be nice to be able to shake the phone to quickly stop and start the playback, or if it is in Zzzz sleep to restart the timer. Great app, and would appreciate the ability to tell playtime within each track, not just total time played and remaining of entire book. I juggle between iPhone and "mp3 disc" player in car and it is difficult to locate time on long track. How to you add audiobooks to the library? It doesn't seem to be syncing up to my itunes library. Can I add podcasts to my library directly from the app? I need to transfer the audiobooks I have in this app on my ipad to my computer. How? I have tried everything!! Please help! BTW...It does not transfer the audioooks to itunes when I sync my iPad! That does NOT work! Help! I can't delete books off the player and every time I put a new book onto the player it mixes up the old books and the new books under the new book title. I use WMA files from the public library (Overdrive) so the files don't show up in my iTunes on the computer (though they show up and play in iTunes on my iPhone). It is driving me crazy to have chapters from various books all mixed up and having to search for the proper next part manually!!! the problem I'm having is none so far have a file manager system and ease transfer multi files from Mac to iphone (audiobooks have many files) as goodreader does. so as your app is highly rated, ease tell me how you transfer files? I don't want to DL your app yet as it's an annoying time trial and I may suddenly have work change so won't be able to fully test it. would be better to make it limited by number of audiobooks so people feel relaxed to try it. sorry I know you have tried to accomodate try before you buy but my schedule is not routine. After reading some of the reviews I find that this app is reliable to fulfill some of my conditions but still lacks something at some places which I think should be covered to get results to the fullest. I have many audiobooks loaded. Ripped them right from the CDs. Most are fine and play in order. Some do not and I am clueless why. I did the exact same thing with all the books and the ones that don't work can be seen in "date added" order but whan you make them an audiobook the order gets all screwed. I can i get them such they are correct order in the app? IOS. Thank you. Today I will share with you top best ringtones in 2017.you will music music, experience the hot tunes.You can refer and see more instructions to download ringtones for your phone.